Welcome to personalizeddice.com! 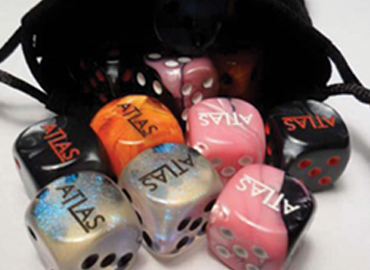 Here you will find a wide variety of Custom Dice. There are many things you can do with our dice, including thousands of games. Here at 521 Promo we can create custom dice of many shapes and sizes. 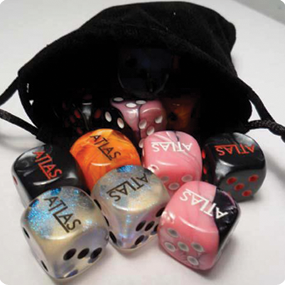 We offer one of the largest selections of personalized dice with even lower qtys!. We have worked really hard to be able to provide our customers with super low qty's on Custom Dice at affordable rates and amazing quality. We have the capability of manufacturing the Personalized Dice here in the US or At our over seas factory the choice is yours. We have many colors available for personalized dice, ranging from opaque (solid) to transparent and even marbled and smokey Dice. These are novelty dice so they will not be measured or metered for precise rolling. We do however offer casino quality dice, these can not be customized as of yet. MIN. ORDER ONLY 5 PAIR! That's right you have read correctly. We offer a min. order of only 5 pair of dice! These are high quality and ENGRAVED! We have the capability of engraving all 6 sides on these personalized dice. The min. orders are available with 5/8" dice only at this time but we hope to expand that in the future. We have way to many colors to list,which are also always changing, so please contact us for the up to date list to choose from. Custom dice are great for promotion of your company, party, brand, wedding favors and much more! Most of all these dice are at the most affordable prices. Dice have been around since medeval times (though they didn't roll so great) but they have been keeping people of all ages engaged and entertained for hours. There are so many dice games available that it is pretty cool to have your very own personalized dice to play them with. Here you will find a huge list of dice games wikipedia.org. WHAT SIZE IS GOOD FOR ME? The size you choose for your dice is really personal preference, but here are a few common uses for each size. 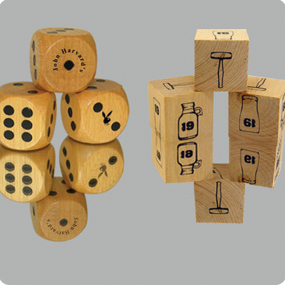 1" dice are usually used for promotional purposes by companies to bring to trade shows etc. 3/4" and 5/8" are both used in several board games and casinos, so this really is personal preference. 3/4" loaded dice are weighted dice, these are used a lot for weddings so their name and date comes up on every roll. 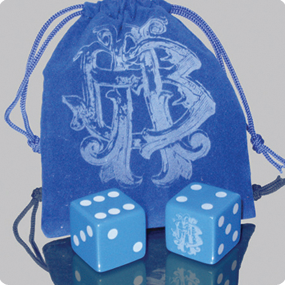 They are also used for name branding, as trick dice and promotional. To order your own set of Custom Dice all you have to do is send us an e-mail 521promo@gmail.com or call 678.866.3583 Mon-Fri 9-5 EST and someone will speak with you regarding your order. We will set-up your personalizeded dice in our templates and send to you for approval. Once approved production is about 2 - 3 weeks. For qty's under 100 dice please contact us for pricing.